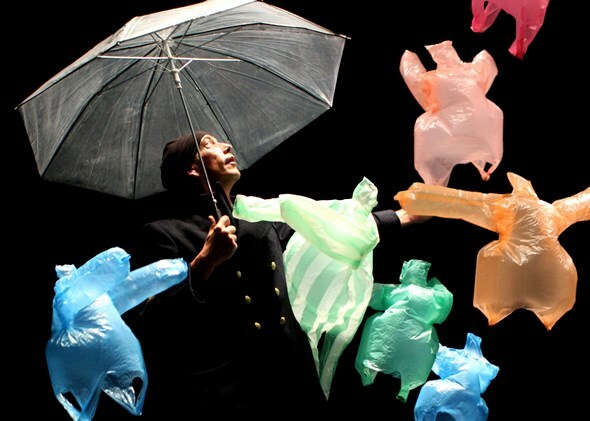 Review: “L’après-midi d’un foehn” (Compagnie Non Nova, France) thru Jan. 27 ★★★. “Us/Them” (Bronks, Belgium) thru Feb. 3 ★★★. No small part of what makes any season at Chicago Shakespeare Theater distinctive and intriguing is its annual bundle of imported shows. While the visiting productions can be grand scaled, they can also be diminutive – and in the latter case typically off-beat, not just novel but beguilingly imaginative. Two such instances of theater writ small now occupy spaces at CST: “L’après-midi d’un foehn,” literally an air ballet of plastic bags set to Debussy’s music, and “Us/Them,” the perspective of two children on a terrorist invasion of their school. “L’après-midi d’un foehn” is as slyly titled as it is delightfully clever. While a recording of Debussy’s “Prélude a l’après-midi d’un faune” provides the principal accompaniment to this 30-minute arabesque of plastic bags cavorting both on the floor and in the air with amazing discipline, the “foehn” in question has nothing at all to do with the satyr-like creature of Debussy’s music. Look up the word foehn, as I had to do. It is not Dutch for faun, or faune in French. Nope, a foehn is a warm, dry wind blowing down the side of a mountain. And notice that Debussy’s word Prélude is dropped from the title of this airy contrivance devised by Phia Menard, artistic director of Compagnie Non Nova. This is the very “afternoon of a foehn” – a delicious pun. 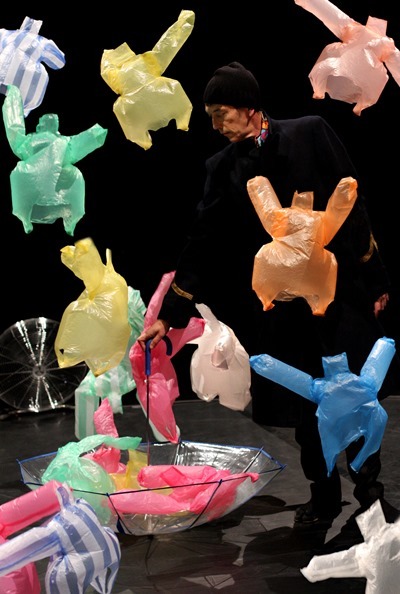 The “warm, dry wind” is provided by six large floor fans, arranged in a circle, that cause first one ordinary little plastic bag – albeit anthropomorphically trimmed – to pirouette and soar and generally seem to exalt in midair, then a second and a third until finally a dozen or more of these colorful, magically choreographed forms are flung into the aerial dance by the tall, impassive figure of Jean-Louis Ouvrard. The silent Ouvrard, draped in a long dark cloak, is something of a cross between the mysterious Drosselmeyer in “The Nutcracker” and the mystical Wizard of Oz. With an intimate audience pulled in tight around the performance circle – backstage at CST’s new space The Yard – Ouvrard began the show by ceremoniously snipping and taping one small pink bag to give it a vaguely human outline. Then he proceeded around the circle, firing up the uniformly angled fans one by one. It’s raining bag-puppets on the foehn-blown stage at CST. Seating himself at a small control center just off the circle, Ouvrard then became puppet-master of his increasingly populous corps-de-ballons. Until near the end, one could hardly speak of a dramatic narrative. “L’apres-midi d’un foehn” is much like a fireworks display: Its controlled, eye-popping, exuberant existence is the point. But just when it all seems to be concluding on a most remarkable note, a bit of sinister narrative jolts the fabulous vista. The ballet – the world of these precious buoyant forms – ends with a grisly whimper. 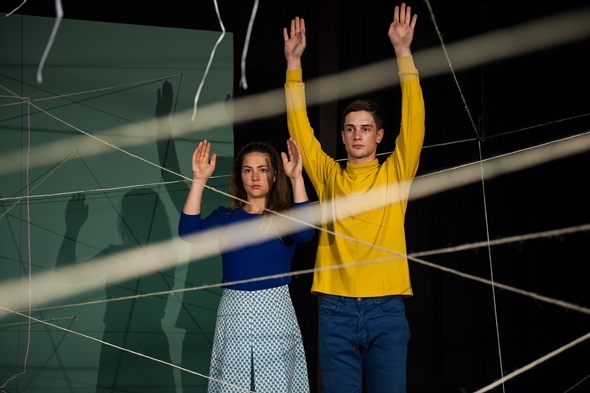 The narrative in “Us/Them,” which occupies the Upstairs Stage at CST, is more direct and specifically tragic.Told in surreal fashion by two children, a boy and a girl, this memory play is historically based on the 2004 invasion by Chechnyan separatists of a school in Beslan, North Ossetia, an autonomous republic in the North Caucasus region of the Russian Federation. Writer-director Carly Wijs created the work in collaboration with Thomas Vantuycom. Over the course of an hour, two kids (the charming and intent Gytha Parmentier and Roman Van Houtven) recall in great detail the three-day siege that historically – albeit outside the bounds of this telling – left 186 children dead among more than 300 victims after Russian forces stormed the captured building. The child-narrators elaborate on the terrorists’ delicate process of changing sentinels at the pressure-sensitive detenator-box. The children are focused on very precise points – not so much on their fear, but rather on the terrorists’ routine and procedures as well as the effect on their own bodies as they experience extreme dehydration and go without food. They must stand with their hands raised; they are not allowed to speak. They begin to hallucinate – a welcome condition, as it removes them from the terrible reality at hand. But before getting to the terrorist siege, these two very ordinary schoolchildren first draw us a map of their school on the floor: It’s a complex layout that they know very well. There are safe places and secret access to hidden basement rooms and provisions for barricading doors. Just in case there is ever danger. The school is a secure place for kids. Until it isn’t. Now more than a thousand children and adults have been herded into the gymnasium, where it’s very hot. The terrorists have cross-hatched the gym with wires attached to a detonator in the middle of the room. The two kids show us how the terrorists did it, using great lengths of string to create an intricate web, every strand leading back to that fascinating, dangerous box on the floor. The kids also show us how one terrorist has to keep constant pressure on the box-detonator or the bombs – large black balloons in their telling – will go off. Every two hours, a different terrorist takes over box duty, the change executed with utmost care to maintain exact pressure lest the bombs explode. There’s some self-conscious humor in the story-telling, but it’s hard to laugh when you’re looking at children terrified, their bodies failing them, on the precipice of death. For a time, they confidently await the arrival of their fathers, whom they envision riding in on tractors, superheroes who will rout the terrorists and save them. It doesn’t happen that way. “Us/Them,” which is performed in English, has the singular look and resonance of “Endgame” for children. Lighthearted, it is not. More like heartbreaking.